Let’s start off with a quick update. As you’ve probably noticed already, the article series title has changed from Hold ‘Em & Fold ‘Em to MTG Metagame Finance. I feel this is a more accurate description of what this article series is really about. There are many amazing people out there who write about MTG finance. The content revolves around a lot of different aspects of the market. For example, some people focus on pure speculation based on the latest news, or data-driven assumptions. Others like Sigmund Ausfresser like to focus on older formats. And there are people who are experts on things like EDH/Commander. However, as many of you might know by now, I’m really a tournament guy. I like to look at daily results from Magic Online. I check Star City Games, Channel Fireball, and TCGplayer several times a day. I’m constantly on sites like MTG Stocks and MTG Top 8 to look at tournament results. I’m also in some chat groups with quite a few Magic grinders. And I used to play quite a few tourneys before I had a baby. So all in all, that’s truly where my Magic heart is. Thus, I think the article series name change makes more sense. But feel free to hit me up on social media or the comments below if you have suggestions that might help people find this article series even faster via a web search. 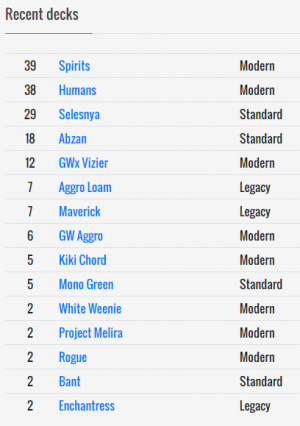 Bant Spirits is one of the best decks in Modern right now. It was the most represented deck in day two at SCG Baltimore, although it didn’t make the top eight this time. Does that mean the deck is on a downturn? I don’t think so. I doubt it will be down for long, since it plays two of the most impactful one-mana spells in Modern: Aether Vial and Noble Hierarch. For more on the archetype, read Dylan Hand’s article on Star City Games. So why am I mentioning Drogskol Captain as a Fold? Well, this is the only printing of the card, and Wizards seems to love printing new tribal product. So I could easily see this getting reprinted. However, foils are a bit trickier. Since this is the foil version of the original printing, it’ll hold a premium. Plus, it probably won’t see a foil reprint in a tribal product if Wizards comes out with one. So I could also see holding onto the foil copies if you want. This card is so versatile, and it’s finally starting to drop in price as more Guilds of Ravnica is opened. This is going to be a tournament staple for a long time. It hasn’t even been out for half a year, and look how many non-Standard decks play this card already. One thing I would be careful of is that I could see Wizards making this a promo down the road. So keep an eye out for that. But for now, this is a solid card to pick up and add to your collection. 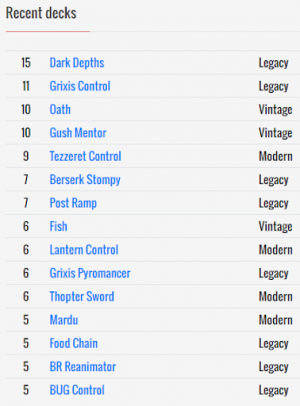 If you haven’t seen the latest Modern Mill deck, take a look at Jason Chung’s (aka sqlut) latest list. This doesn’t see a whole lot of play yet, but the foils are fairly affordable and could spike if this type of deck catches on. Time will tell since Mission Briefing is only a few months old (and a card I mentioned in article #19). One of the readers that reached out to me regarding the free giveaway feature in article #21 suggested fetchlands like Arid Mesa and Misty Rainforest, as well as Scars of Mirrodin fastlands like Seachrome Coast. At the same time, he asked me what I thought about different versions of Engineered Explosives. I responded by saying that I’ve had my eye on a few Inventions, namely Defense Grid, Trinisphere, Scroll Rack, and Crucible of Worlds. I’ve also had my eye on Engineered Explosives for a while now too. But as I highlighted in article #18, I hope you got rid of the non-Invention versions before Ultimate Masters was spoiled. And then a few days later, I came across Pithing Needle and realized I had forgotten to point it out as a target. So I reached out again and told him about this one, as it sees play in quite a few decks. This has been dropping in price since it rotated out of Standard. Yet, it still sees play in a decent number of Modern decks, as well as Legacy’s Dragon Stompy. Most notably, it’s starting to appear alongside Arclight Phoenix, which is popping up everywhere now. Take a look at Jeffrey Carr’s second place list from SCG Baltimore. 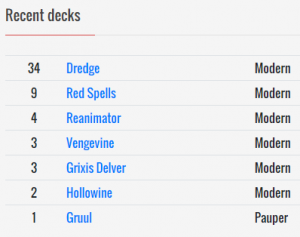 Although Ross Merriam won the event with his Izzet Phoenix deck, people are still tinkering with many different Phoenix builds, all of which can play Hazoret. While we’re on the subject of Arclight Phoenix decks, here’s another pretty cheap pickup. 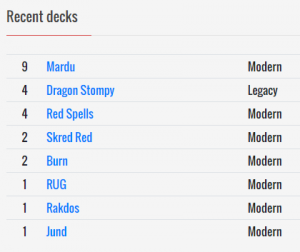 It sees play not only in Ross Merriam’s winning Izzet Phoenix deck from SCG Baltimore, but also started out as a popular card in Dredge which is still a strong Modern deck. 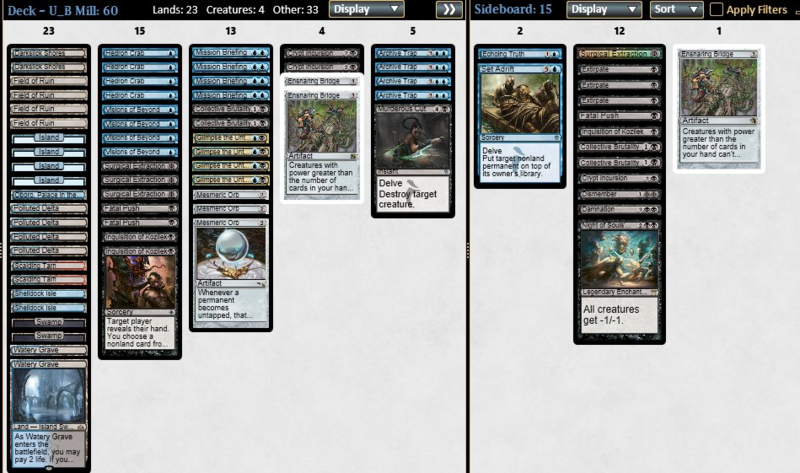 Not to mention Hollow One decks and Grishoalbrand, which also run the card. Finally, it’s always worth noting that the expected value of Shadows of Innistrad boxes is quite low, which probably resulted in a lot of unopened boxes. 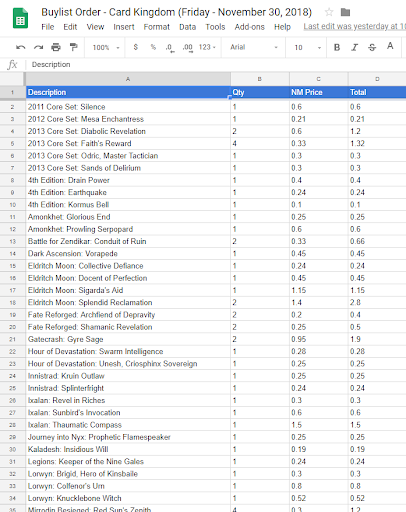 I’ve started another article series called “Magic: The Gathering Questions,” featuring this buylist, plus documentation and the tools I used. Check that out when you get a chance. My goal is to help speed up the way you sell bulk, and light the fire to organize your collection and make some extra money on cards that you’re not using. Office Hours #3 is coming up, which I’ll be co-hosting again with Sigmund Ausfresser. If you have a Quiet Speculation membership subscription, you can catch the audio of Office Hours #1 with Sigmund Ausfresser and me here in case you missed it. Or you can listen to Office Hours #2 with Christopher Martin and me here for free. Office Hours #3 is set for Thursday, December 6 at 8:00 p.m. Central, so mark your calendars and join us in the Discord channel if you have a Quiet Speculation membership subscription. Here’s my buylist to Card Kingdom on November 30, 2018.